Again not in Soho but the King's Road yet this place somehow felt to me so really connected - and it was opposite the Pheasantry! Jon F Alex Strickland had another, his first record shop in Golders Green Road. 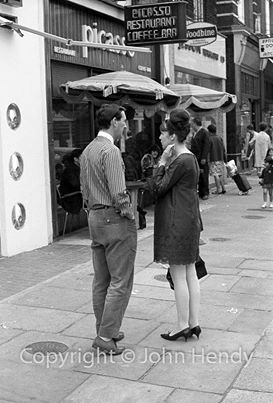 His daughter ( forgot her name) was one of the NW London Crowd pre LET circa 1963/4. 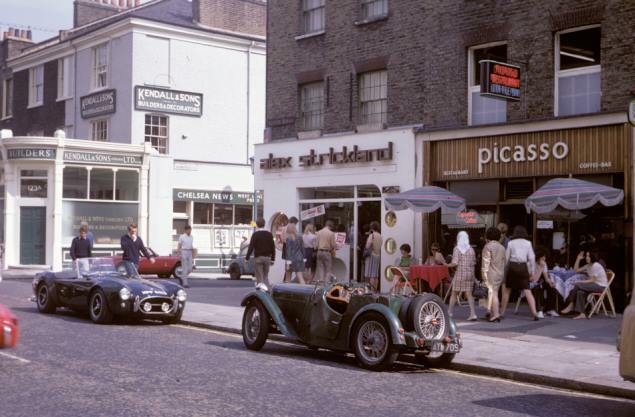 The Strickland shops were the best of their type for the time. All the carrying all the latest vinyl imports. 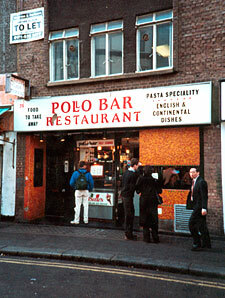 A photo from a time it was well past it's prime but this restaurant on Old Compton Street (just past the Wimpy) was one of my favourites. Always got a nice, cheap meal. 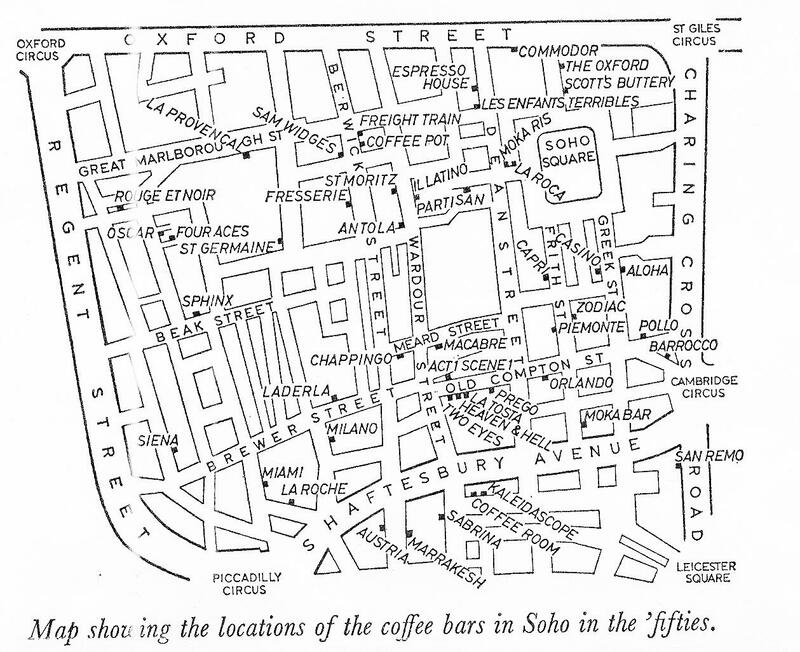 Now I know this wasn't in Soho and not even in London yet I feel I ought to include it just the same. Spiritually it seems to belong here. sharp-eyed Chantal has corrected me. Les Enfants is indeed on the map and at the right place. Hope the other Adrian will forgive me - I wrote and asked him why it wasn't there! 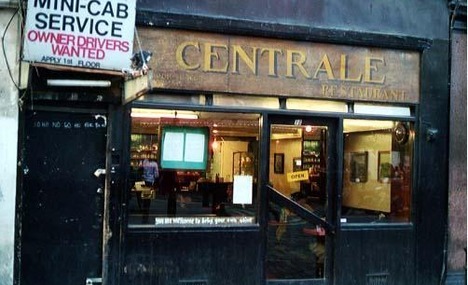 Right in the pivotal centre of Soho, there is a time machine. 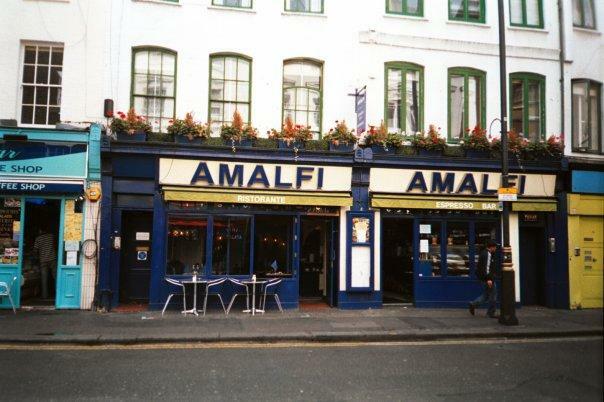 Walk along Bateman Street until you see a café painted as the Italian Tricolore. You really can't miss it. It looks like it's closed, doesn't it? It probably isn't. Try the door. Is it open? Yes? Well, step right into 1955. 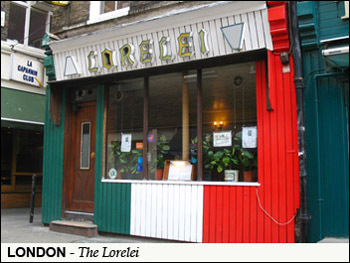 Welcome to the Lorelei – one of the last survivors of 'real' Soho. The first thing you'll notice is that the decor is a curious mix of village hall and alpine hut. 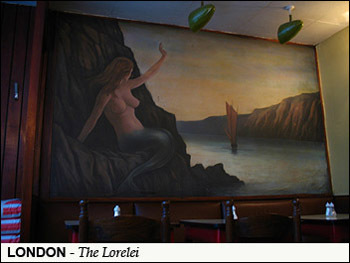 The second thing is the mural of the naked mermaid that takes up an entire wall. I've never seen the odd-looking light fittings switched on to illuminate it. 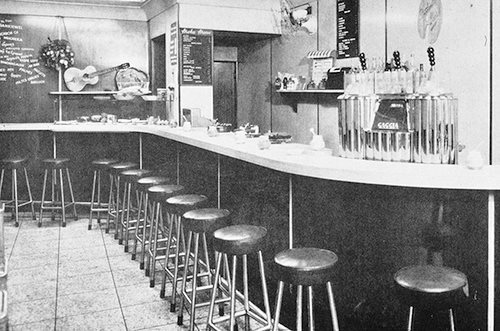 From the Formica tables, the lino floor, to the faux-leather banquettes round the walls, almost everything is as it was the day it opened. In the little kitchen area, the elderly proprietor quietly produces the best pizza in London – the genuine Italian flour for these is stacked up by the front door. Watching the vintage grey-green Cimbali coffee machine operated is akin to seeing Handel himself playing the organ. That's the sound of real coffee being made. Chips come cooked to order, always on an ancient glass plate. A little mound of hot golden matchsticks, sweet and crunchy. How a place so comically un-modern still exists in the centre of this ever-changing city is a mystery. Need the loo? It's in an outhouse down the yard – primly segregated into 'gents' (hand written in gloss paint on a brick) and 'ladies'. Even the plumbing is original. There's never any piped music on – although the dusty old speaker still on the wall no doubt once pumped out Tommy Steele. You bring your own atmosphere. It's the eye in Soho's storm. There's no need to book a table. The staff always seem a bit surprised when anybody walks in. At night, when the window is streaked with condensation you can watch people stop to scrutinise the menu, their faces yellow from its sodium light. 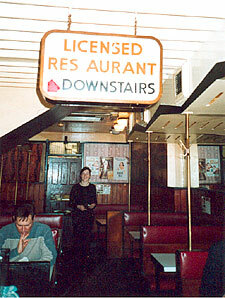 They rarely come in, perhaps preferring the bright lights and familiarity of better-known restaurants. They don't know what they're missing. The world needs character as much as it needs wipe-clean convenience. I think it's still there - have to check next trip! Included as a historical note - hailed by architects and purportedly the first although it opened in 1953 and the Bar Italia in 1947. Interestingly we've had mail from a lady who worked as waitress before 1956 so I wonder how early in the 1950's Les Enfants actually opened. 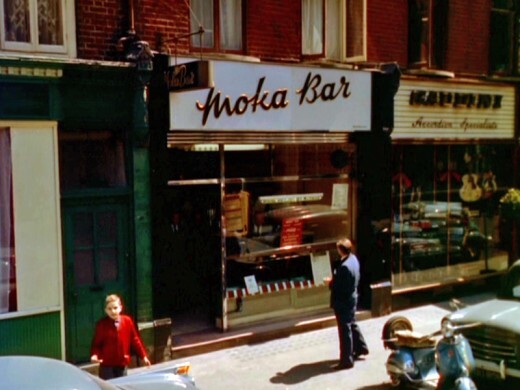 ln 1953 the Italian actress Gina Lollobrigida opened the Moka coffee bar at 29 Frith Street in Soho which provided London with its first Gaggia expresso coffee machine. 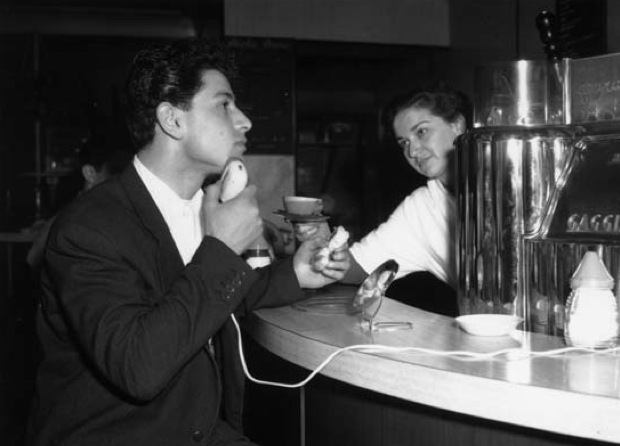 Some have argued that the simple opening of this West End coffee bar was the early morning double-expresso that London needed to kick-start its way out of the grey post-war depression, setting itself up to become the world’s trendiest city in only a decade’s time. 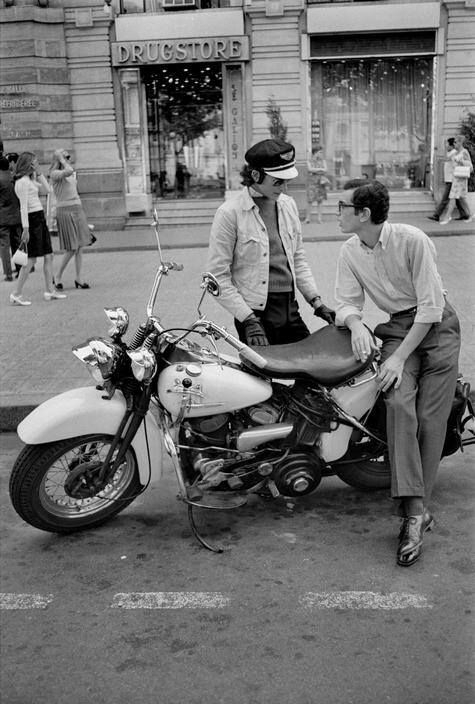 I don't remember too much about the Heaven and Hell except that it was the premises that later (1967 anyone?) became the restaurant Le Bistingo. 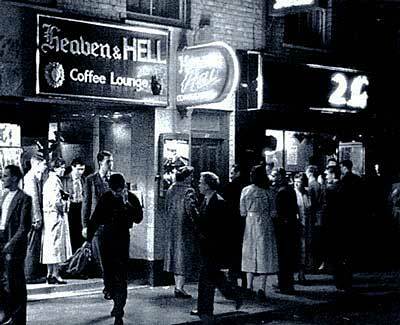 Next to the 2i’s at 57 Old Compton Street was the Heaven & Hell Coffee Lounge, which opened early in 1956. Originally a popular resort that posed a threat to its then-ailing neighbour, it was soon to be eclipsed by the ‘home of the stars’. Owned by Eric Lindsay and Ray Jackson this establishment consisted of the ‘heaven’ of the brightly lit, white-painted ground floor coffee bar and the ‘hell’ of a darker, atmospheric, subterranean room lit by red-eyed devil masks along the walls. Like its neighbour it also offered live music and one of the resident groups playing in the underworld of the cellar was appropriately called the Ghouls. 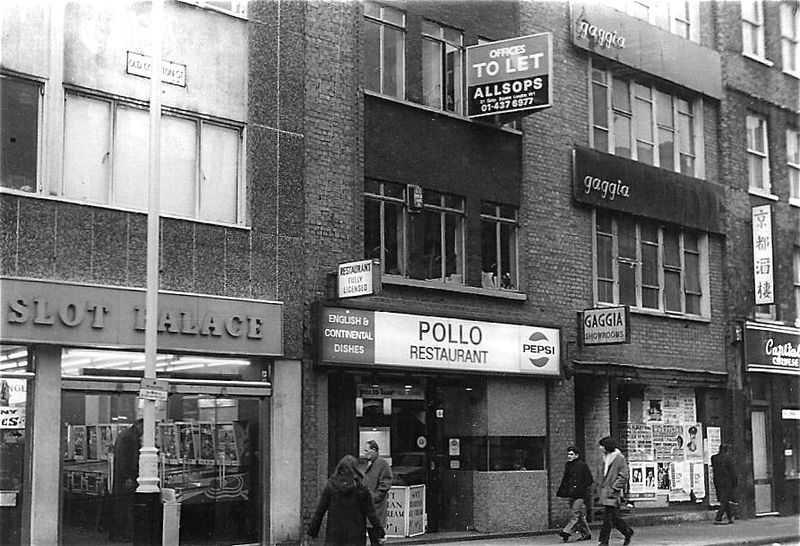 Adrian The new Amalfi (as I now call it) is not even on the original site as that building was demolished, the Amalfi moving closer to Dean Street. It is as the time of speaking undergoing refurbishment again. 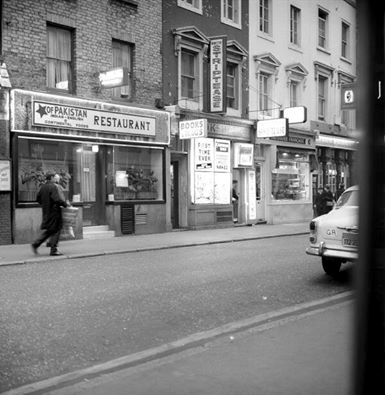 This must be the original shop front and on Frith St, not Old Compton Street. Way before my time. jon f Now a chain with no real atmosphere. 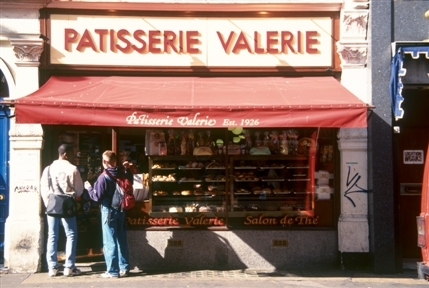 One of the original french patisseries dating way back in time along with Sagne in Marylebone High St.
jon f Loved it , was introduced to it about 1969 or so. 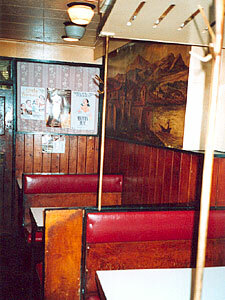 Good old 1950s plastic booths upstairs. Claustrophobically tight seating downstairs. 3 course meal for 5 quid!!! Last time I ate there was 1989. Closed not long after.